When the State of Israel came into existence in 1948, its very legitimacy as a nation was immediately challenged, often by the same people who questioned the rights of the Jewish people to live at peace on their own land. Yet since its independence, Israel has stood out as a nation with a truly democratic form of government surrounded by countries and peoples mostly ruled by tyrants and despots. This has led to wars, border skirmishes and other assaults against Israel This reached a pinnacle with the steady terrorist assaults against innocent civilians known as suicide bombings. Instead of condemning these attacks, many ignored the inhuman brutality or even worse, glorified the Palestinian Arab perpetrators as martyrs. One of the favored forums for attempts to isolate Israel is at the United Nations. Rather than empathy for the Jewish victims of terrorist attacks, the UN has repeatedly excoriated Israel for its actions toward the Palestinians, ignoring the fact that most of the Palestinian people lived in areas controlled by their own Arab leaders. As a result of the onslaught of the Second Intifada, Israel planned and began the construction of a terrorism prevention security barrier. Built roughly between Israel and the Palestinian territories, Israeli leaders made clear that, despite criticism, it was not an attempt to create a border and preempt ongoing negotiations, but solely for the purpose of defending and protecting her people. There have been a number of objections from Palestinians, with support from some Israelis, who felt that they were unduly burdened by the barrier. Many of these complaints were lodged with Israel’s vibrant and independent court system. Instead of rubber-stamping decisions, courts looked at each situation and in some cases have ordered that the route be changed or altered. In 2004, Israel’s detractors at the UN, who refused to even recognize the right or need for Israel to be able to protect its citizens, saw another avenue to demonize the state. Defying its own charter, the UN General Assembly requested of the International Court of Justice at the Hague an advisory opinion about the security fence and its applicability under international law, some calling it an apartheid wall. Few people around the world were even aware that such an important tribunal was looming. Fewer still seemed to understand the potential difficulties it might cause for Israel and other countries desiring to protect their own citizens from terror attacks. One who immediately understood the danger if Israel was not allowed to adequately defend its citizens was Richard D. Heideman. An internationally known attorney, former President of B’nai B’rith International and advocate for the rights of victims of terrorism both in the US, in Israel, in Lebanon and in Europe, he understood how vulnerable innocent civilians would become under such limitations. Heideman filed the only brief on behalf of a non-governmental organization, the Foundation for the Defense of Democracies. He forcefully laid out the case to the ICJ for Israel’s right, and obligation, like every nation-state, to provide for the defense of her population. At the same time, he served as lead counsel at hearings held at The Hague, highlighting the victims and their suffering. 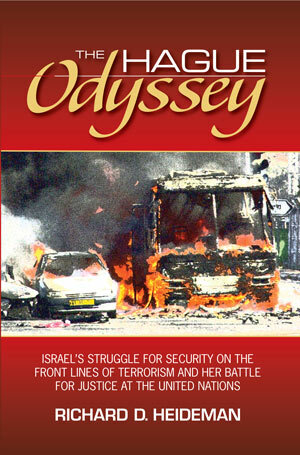 In The Hague Odyssey we follow Heideman’s meticulous and passionate defense of Israel’s right to defend its people. He complements his arguments with sharp, insightful analysis of the Court’s eventual negative and, some would say, inevitable ruling. The Hague Odyssey is sure to be essential reading for any contemporary discussion of the Arab-Palestinian-Israeli conflict and the questionable ability of the United Nations to have a positive role in achieving a just and secure peace among the peoples of the region.